Rhys Bowen is a force of writing, with few who can equal her. She writes the Molly Murphy series, the Royal Spyness series, the Evan Evans series, and the young adult Red Dragon Academy series (with her daughter Clare Broyles). Oh, then there are short stories, too. So, with all of that writing, which is all brilliant, going on, what does Rhys do? Take a vacation? Play the Celtic harp for her amazing husband John? Paint a scene of the Arizona desert? No, Rhys writes a stand-alone book. And, what a book it is! 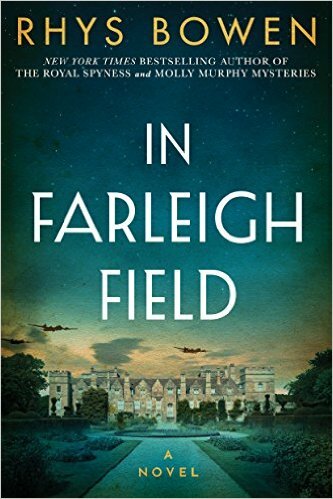 In Farleigh Field hits the bookstores today. Here is my review of another outstanding novel from one of my favorite authors. I have been a fan of author Rhys Bowen's writing for quite some time, having read and enjoyed all of her Molly Murphy and Lady Georgie series. I have a few more to go in her Constable Evans series. It's already impressive that Rhys can write two series a year that maintain brilliant writing, never slipping into predictability, always evolving. Now, this prolific author has given her eager readers a stand-alone entitled In Farleigh Field. I knew it would be good, but it is a stay-up-all-night-reading good. It hits so many of my favorite reading buttons, with the setting being England during WWII and the involvement of M15 and Bletchley in a thrilling plot of deception and daring. So many small cogs in the big wheels that had to turn for Great Britain to survive the Germans, and Rhys Bowen places us dead center in the machinations of that survival. It's springtime 1941 in England, and Dunkirk and the Battle of Britain have already claimed the lives of many soldiers and battered London and its civilians, too. The men and women who wear the uniform acknowledging their fighting for their country are respected and admired. However, there are many young people who are vital to the war effort who must remain silent about their participation and suffer the attitudes of others that they aren't really doing much to help. In this world of behind the scenes participation is young Ben Creswell, 21 years old and the son of a vicar. Ben suffered an injury to one of his knees before the fighting started, and he is to all appearances doing an unimportant desk job in London. But, Ben is a part of the central nerve of the war machine, working for M15, and due to his connections to the Farleigh Estate in Kent and its residents, he is tapped for an investigation into the death of a parachutist, who falls from the sky into a field of the Farleigh grounds. There is much suspicion surrounding the dead man, as he is dressed in a British uniform, but with too many mistakes on that uniform to be considered anything other than a spy. Pamela Sutton, the third daughter of five daughters of Lord Westerham, owner of Farleigh Place, is a close friend of Ben's, having grown up with him and played as children on the estate. She, too, must suffer the appearance of doing boring clerical work for the war, but she is working at the code breaking center Bletchley Park, where her talent at discovering the unusual doesn't go unnoticed. She is given an assignment to decipher some information that will ultimately lead to a parallel path with Ben's mission of ferreting out why a German spy would end up in a Farleigh field. Pamela, or Pamma, as friends and family call her has long had the attention of Ben Creswell, but he has never pursued a relationship because she and their other cohort in youthful adventures, Jeremy Prescott, another aristocrat, had long ago laid claim to Pamma. Jeremy is a member of the RAF and recently escaped from a German prisoner-of-war camp in France, now recuperating at his father's estate at Nethercote in Elmsleigh, Kent. Pamela, Jeremy, and Ben all find themselves reconnected at home while Ben is pursuing clues to the strange death at Farleigh. And, there is Pamela's sister, Margot, who finds herself stuck in Paris after the Germans invade and occupy France. Margot's lover is a member of the French Resistance, and, thus, Margot is herself in danger of being arrested by the Nazis. Ben is also tasked with discovering whether Margot or any other member of Pamela's family may be in collusion with the Germans. It is hard for Ben to believe that there are English who want the Germans to invade and the fighting to end by their occupation of England. However, certain aristocrats and others in England are actually involved in efforts for just such an outcome. The answers Ben needs to discover require dogged pursuit and belief in the unlikely. Of course, time is always of the essence and lives hang in the balance in finding those answers. Major kudos to Rhys Bowen in achieving a smashing success with this new novel. It is historical fiction and mystery combined to their best, a puzzle to piece together in the midst of a war which threatens to destroy a country and its way of life. The suspense is first-rate, with the chance of betrayal or discovery nipping at your heels. The characters are so well developed that I felt a personal stake in the outcome, and the parts they play are built upon their relationships to one another. Pamela and her four sisters are all intriguing in their own right. The plot is a great puzzler with an unexpected, but absolutely plausible, ending. And, one of my favorite parts of historical fiction is learning history through the well-researched bits and bobs that we don't usually read in the history books. The comparisons and contrasts of how the ordinary citizens and the aristocratic families dealt with supply shortages and what were considered hardships by both are most interesting. In Farleigh Field is sure to be one of the most read books of 2017, and already one of my favorites. I received an ARC of In Farleigh Field, which in no way influenced my amazing experience in reading it.